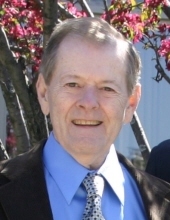 William S. “Bill” Knaus, 79, of the Town of Sheboygan, died unexpectedly Saturday, January 26, 2019. Bill was born August 14, 1939 in Sheboygan to Stanley and Elizabeth (Feudner) Knaus. He attended Ss. Cyril and Methodius Catholic grade school and was a graduate of Sheboygan Central High School. Bill served his country in the US Navy for two years in the Naval Reserve, two years active duty as a torpedo man aboard the USS McCard, and two years inactive duty. He worked at Manning Lighting for a few years before beginning employment at Brunette’s Ace Hardware as a carpet installer and later at Eclipse Mfg. until his retirement in 2007. Bill was previously married to Sandra Immel. He was a member of Holy Name of Jesus Catholic Parish where he served as an usher, as well as the Sheboygan Rifle and Pistol Club in the town of Mosel. He enjoyed fishing and hunting and in later years took up the game of golf. Bill liked to work jigsaw puzzles and frame them as gifts for his friends and family. On July 3, 1982 Bill and Patricia A. Rapin were united in marriage at Holy Name of Jesus Catholic Church. In addition to his wife, Patty, Bill is survived by his son, Timothy (Nancy) Knaus of Orland Park, IL; his daughter, Laurel (Jeff) Wriedt of Sheboygan; his grandchildren, Abrianna Knaus, Madeline Knaus, Nathan Knaus, and Daniel Knaus all of Orland Park, IL; his brother, David (Diane) Knaus of Sheboygan; his sisters, Kathy (Mark) Rammer of Sheboygan and Jane Ross (Stephen) of London, England; his brother-in-law, Joseph Strohmeyer of Sheboygan; and other relatives and friends. In addition to his parents, Bill was preceded in death by two sisters, Jane Knaus and Mary Strohmeyer. A Mass of Christian Burial will be celebrated on Friday, February 1, 2019 at 11:00 a.m. at Holy Name of Jesus Catholic Church. Rev. Matthew Widder will be the Celebrant. A time of visitation and support will be held at the church from 10:00 a.m. until the time of service. Burial will follow at Calvary Cemetery. To send flowers or a remembrance gift to the family of William S. Knaus, please visit our Tribute Store. "Email Address" would like to share the life celebration of William S. Knaus. Click on the "link" to go to share a favorite memory or leave a condolence message for the family.